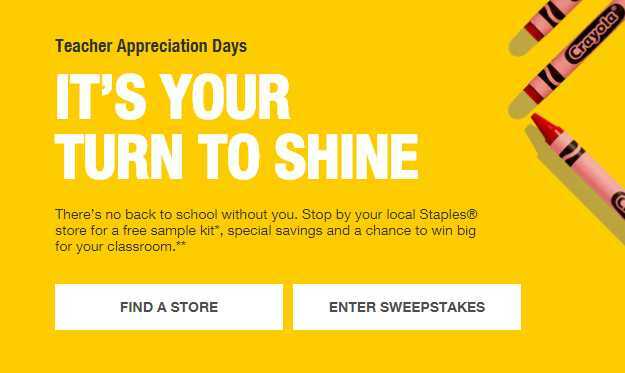 If you’re a teacher and want to get free School supplies then you can enter Staples Teacher Appreciation Sweepstakes 2018 at staples.com/teacherappreciation. 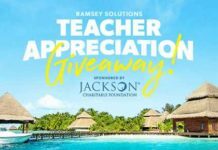 10 Lucky winners will be chosen by random draw and get a Sponsor-Specified Assortment of (K-12) School Supplies. 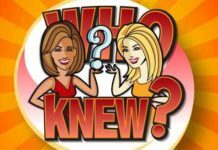 Eligibility: This Free Online Sweepstakes is open to United States of America and District of Columbia who are 21 years of age or older and must be teachers at an accredited K-12 school with a valid teacher ID proof. 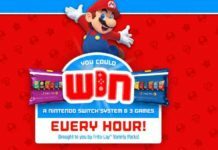 Sweepstakes Period: Begins at 8:00:00 a.m (ET) on July 20, 2018 and ends at 11:59:59 p.m. (ET) on September 8, 2018.